--one mom covers her baking sheet with tinfoil before melting candy on it. Why didn't I think of that? It would have saved me hours of scrubbing. --one mom had a hard time pouring the density rainbow over the spoon, so she used a syringe instead. Perfect rainbow. --Monitor your candy as you melt it--if your microwave is hotter than mine, you definitely don't want to microwave a Starburst for a whole minute. 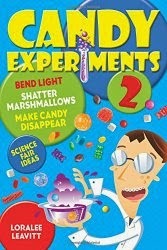 Thanks for sharing your ideas, and for helping me improve candy experiments.